American Eagle Series plaques, trophies and crystal glass. American walnut plaque with a finely detailed black and gold eagle medallion. 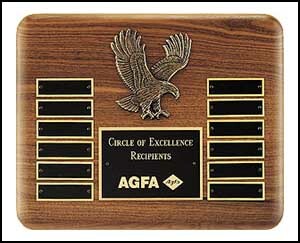 8"X10"
American walnut perpetual plaque with 12 black brass plates and a sculptured relief eagle casting. American walnut Airflyte frame with a sculptured relief eagle casting on a black velour background.